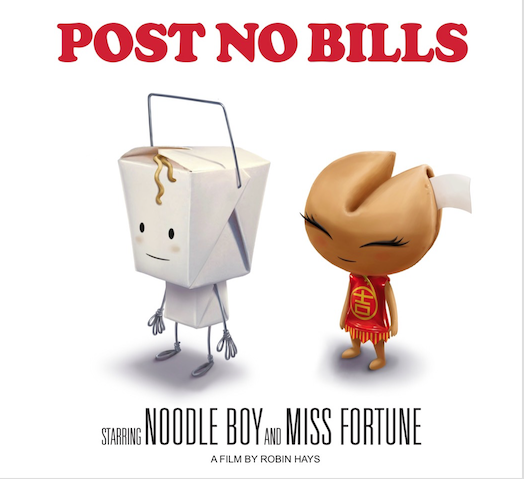 On an urban city wall plastered with posters Noodle Boy must face his fears and make his way through a series of obstacles and challenges in order to save the beautiful Miss Fortune from the city’s clean up crew. There is a very old piece of graffiti that sometimes gets added to the usual sign put up on blank walls and hoardings for “Bill Posters Will Be Prosecuted” that proclaims “Bill Posters is Innocent!” and “innocent” is the word that came to mind while watching this utterly charming 4 minute long animation. The mix of styles, the 3D Pixar-like style of the real world and the 2D animated drawings on the posters work very well together and I must admit that my main thought on first watch, well two thoughts actually, are that this premise should be made into a computer game and then merchandised to the eyes. Who wouldn’t want to play a platformer as the brave Noodle Boy galloping on a caffeinated rooster (not as weird as it sounds, honestly) across various interactive posters to save the delightful Miss Fortune with her (literally) sweet fortune cookie face. Or, of course, vice versa because that would be just as much fun. And I want a Miss Fortune T-shirt! So now that I’ve copyrighted that idea by writing it down (OK maybe not), what of the film itself? It really benefits from not having intelligible dialogue, to be honest. The simple background music and just the sound of their voices and their actions is more than enough to get the story across. I loved the variety of posters that he had to cross too, from bouncing Sonic stylee along the bars of a graphic equaliser on a club poster to pole vaulting a growly Security Warning dog using musical notes from a piano tutor’s ad (you can see why I thought computer game now can’t you?) before either he or Miss Fortune are wiped out by the ever-advancing glue roller of the clean-up man. Will he make it in time? And if the humour and peril of the adventure haven’t totally hooked you before then, I guarantee you will be clamouring for more with that ending and its powerful message, which will stay with me for a long time. This is a glorious, engaging little film, with a premise open to expansion and such endearing characters that they deserve to become something much, much more than just a 4 minute short.